The "Icthy Foot" is highly contageous, and the restless sufferers who try to satiate it with movement find that the condition only worsens. Beware, you only need to see the photos and scribbles they leave behind to catch it yourself. There is no cure. Post Camino: Planes, Trains, Automobiles, and Gliding. One of the things that many pilgrims talk about along the Camino is when and where you will finish. While the center of Santiago and the tomb of Saint James is the pilgrimage’s official end, many pilgrims choose to continue walking toward the ocean to Finisterre “Land’s End” and finish their walk there. I think this is wise. Apart from experiencing more of Galicia’s scenery near the coast, I think walking to the literal end of earth, overlooking an endless ocean, would be a more symbolic and impressionable finish than the anti-climactic feeling we had upon finishing in a crowded plaza amid urban sprawl. 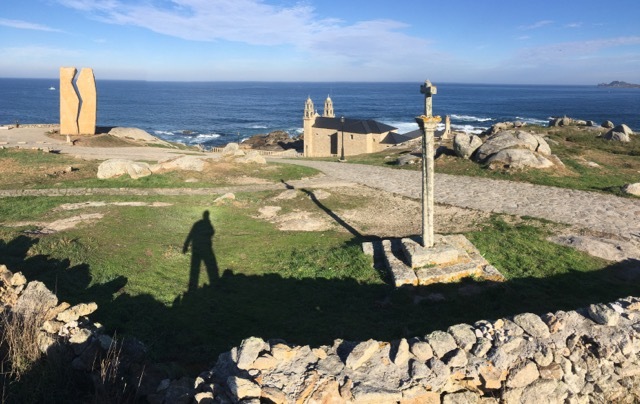 With our remaining time, Kim and I did not want to use it up with the 3 days required to walk on to Finisterre, but we did decide to join in a package all-day bus tour to Finisterre, Muxia, and other sites along Galicia’s Costa de la Muerte. It was the first time we had taken any form of transportation, other than our feet, in 27 days. It was a nice tour; just sitting on the bus for the ride felt rather mindless and therapeutic. Off the bus, we had time to explore various sites. Though Finisterre is the more celebrated end, and we had one of our finest seafood lunches in the actual town, we liked Muxia better for scenery. Martin Sheen must have agreed, as the movie “The Way” decided to use Muxia for their final scene at the sea, instead of Finisterre. Upon returning to Santiago, we grabbed some dinner snacks and boarded a fast train to Ourense, where we were kindly picked up and driven into Portugal by Filinto, the father of Duarte, my Clemson friend, housemate and PRTM colleague (Parks, Recreation, & Tourism Management). Duarte is from Portugal, but has remained in the states, now a professor at NC State. 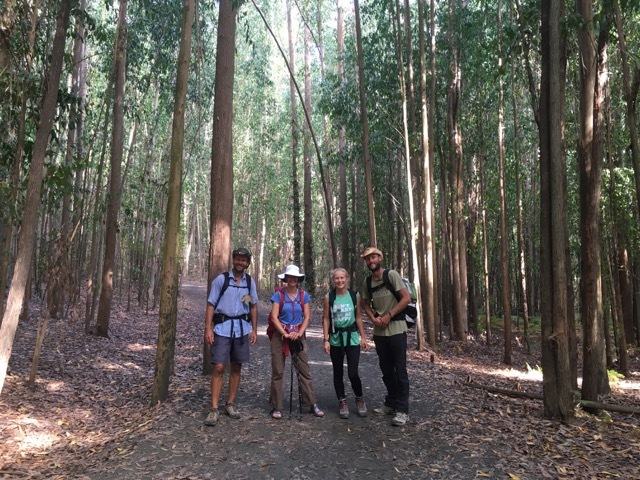 He offered his village home in Sao Lourenco for us to stay in, and arranged for his family to welcome us. We stayed for 3 nights, the first time in 28 days that we had slept in the same place more than one night. Kim and I both looked forward to chillax there as a post-Camino break. It actually turned out to be not as much down time as we thought, thanks to the hospitality of Duarte’s family. Our very late arrival meant we essentially had 2 full days there. After sleeping in heartily and cooking ourselves a great breakfast the first day, Filinto picked us up and gave us a driving tour of the countryside and then to their amazing family run bed & breakfast “Quinta de Mata”, an old estate house which they now run as a permaculture farm. We had lunch there, then we went into the city of Chaves, where we had coffee, drank some natural thermal waters, and walked around the historic center with its intact castle tower walls and Roman era bridge. The next day was supposed to be our do nothing day, but Duarte’s brother Luis invited us to join him as he was helping lead a group paragliding off a chapel-topped mountain overlooking Mondim de Basto. 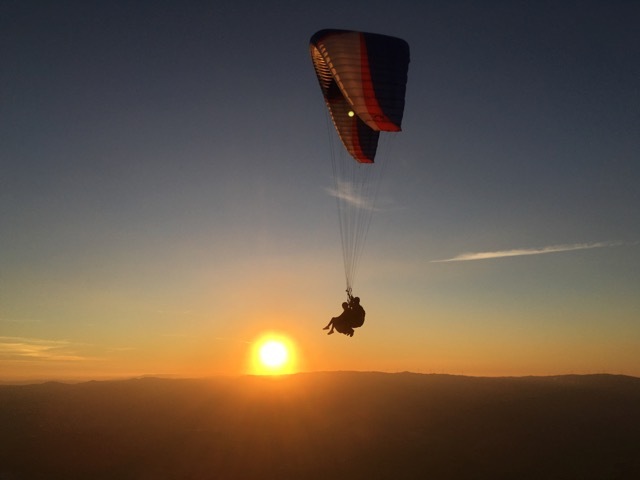 Luis is an avid paraglider and instructor, so I felt like it was an opportunity I couldn’t turn down, but Kim decided to stick with the plan to stay in the village and relax. It turned out to be a high-low day. I was only supposed to be gone half the day, but due to unfavorable winds, the launches were delayed till late afternoon, and I had no way to contact Kim, and we didn’t get back till late at night while she waited around. I did a lot of waiting around myself with Luis monitoring the winds, and when they finally could launch, I just hung out watching. It’s an impressive sport, where you catch rising hot air currents from the valley and you step off the mountainside and ride them up, down, and around. At the end of the day, I got to do it myself, riding tandem with Luis, as the sun set. Rushing down in a spiral, to beat the coming darkness, we actually descended a little beyond our target landing zone, but Luis steered us over the tree tops and expertly “crash” landed us on the edge of the nearby road. It was fun and if there were facilities / conditions to do it around Asheville, I’d probably get into it too. I thought it was more of an adrenaline sport, but upon witnessing it, floating with the thermal winds is one of the most serene things you can do. Saying good-bye to Duarte’s family, they dropped us off at the Chaves bus station and we took a bus to Porto, about 2 hours away. Kim’s parents wanted to treat us to a fancy hotel while we were on the Camino, but we never really found anything that was “fancy” beyond the pleasures of clean, tidy, and private small hotels. So we targeted Porto for a little bit of indulgement, having heard everything was cheaper there. But arriving on the tail end of the weekend, all the places we checked that looked nice in the lively / scenic part of the city were full. We eventually found a room available, close to things, but nothing special, actually below par with the private rooms we’d enjoyed on the Camino. Still, it was adequate, and we only planned to sleep there, while we spent the day exploring. Porto is quite scenic with steep urban hillside on both sides of the river, spanned by an Eifel-esque steel bridge. 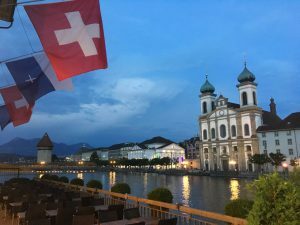 We walked around, surprised at the bustling crowds of tourists and others enjoying the outdoor cafes along the streets and the river. On the other side of the river, we got a nice lunch of presunto and other small plates that made for a big meal. We toured a local port winery, watched the sunset over the river / city, and got dinner at an African restaurant in one of the narrow alleys. More time there would have been nice, but we were eager to get to Lisbon, so the next morning we took the express train south. 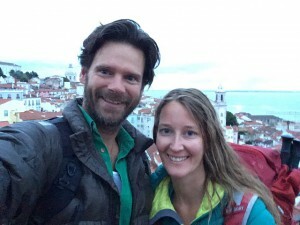 We arrived Lisbon mid-morning and promptly walked to our Airbnb lodging and dropped off our bags. We stayed in Alfama, a wonderful neighborhood of small homes, cafes and narrow, multi-angled streets on hillsides coming up from the port toward the Castle of St. George. We loved the location as a base to walk around and even get lost in the maze. After walking near our neighborhood, and down into the more modern center and eating a take-away lunch in the plaza, we joined a free (tip only) walking tour. The “chill out” tour was from a local, cultural perspective more than sites, history, and dates. We enjoyed it a lot. It actually ended just a stone’s throw from our lodging, so we went back there for a little break, before heading out for a view of the sunset and dinner in the adjacent neighborhood hill of Graca. 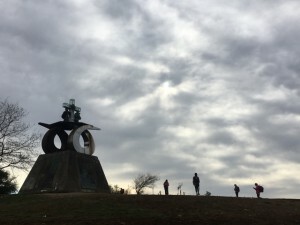 After sleeping in and enjoying a light breakfast on a nearby terrace overlooking the city and Tagas River, we returned to Graca, and went to a big flea market that happens on Tuesdays. It was part touristy and part thrift store. I enjoyed more of the thrift store side of things, getting some cheap used garments (my favorite kind of souvenir). I had already “retired” several garments through the trip, so this was my way of replenishing them on the last day. 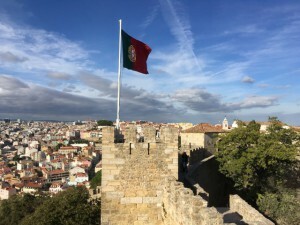 We got lunch in a small courtyard restaurant back in Alfama, and after dropping our purchases off back at the room, we headed to the Belem part of Lisbon via trolley car and train. It was a bit of a disappointment with its museums and monuments either closing or covered with scaffolding, and not much in the way of nightlife after dark, so we returned to Lisbon and got dinner in Barrio Alto. As we finished eating, it started to rain, a rare thing in Lisbon, and we got wet as we navigated the streets heading back to our place. It was a bit of damper on our final night, amplified by the fact that we couldn’t find any open supermarkets to blow our final euros. We did eventually find a small overpriced shop, and I bought some bottle of port wine to take home. I was also a bit disappointed that we did not make the time to take a day trip to nearby Sintra, but as we returned to our room, all wet, I thought about how this bit of rain was a reminder to be grateful. We really had astounding weather for the duration of our trip. Despite some imperfect days, towns, situations, and our imperfect selves, we really had an amazing trip; better than we could have hoped for or strategically planned for. I think I was still feeling grateful for our overall experience as we journeyed home the next day. Getting home was not perfect, with misinformation getting to the airport, with our “plain” plane, and then a mechanical delay in PHL caused us to miss our AVL connection in CLT, and spend an additional night in an unoriginal American chain hotel. While we weren’t happy about it, we felt the ire and moans of the other American travelers around who expect things to be efficient and flawless. And I felt mostly gratitude welling inside me and said “Oh well” to myself; we’re coming home from an amazing trip; what a privilege and an honor it is to do what we’ve done. We (humanity) would be a sad lot of pilgrims if everything on our life journey went our way, all the time. We arrived Asheville in the morning, Oct. 13th, on a cool crisp day, the beginning of fall colors visible in the mountains from the view from the plane. We ubered to my house, where we receive a grand celebration from El Guapo. Kim and I gave a long grateful hug to each other, and she drove on to her house. It was a work day, and I knew there was a lot of things to get back on top of, but I did not want to jump back into that just yet. It could wait a little longer. I drove up the BR Parkway a bit and took El Guapo for a hike on one of my favorite stretches on the Shut-In Trail. I am grateful that in my life, I have had such opportunities to explore and travel, but I am also very grateful that the place I come home to is a wonderful place to be. It felt good to be away. It feels good to be home. How can I not be grateful? While it was still dark, we quietly left our albergue with breakfast snacks in hand and joined the quiet procession of dark figures moving through the streets and forest lanes toward Santiago. 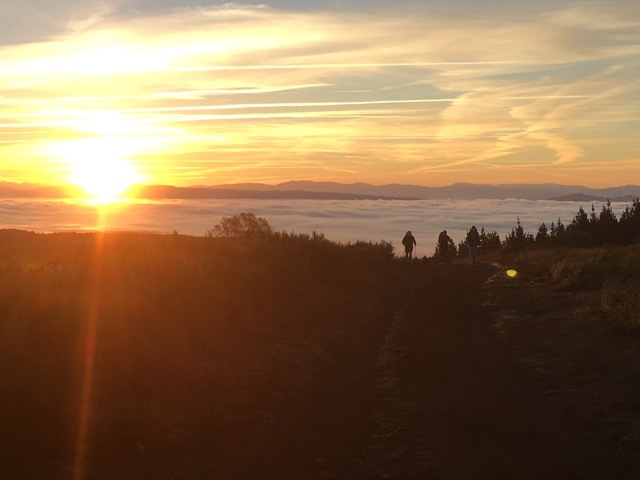 A beautiful sunrise soon greeted us, and we only made a brief breakfast stop after getting further down the Camino. There’s really little to note about the Camino or the towns it passed through during this stretch, for this stage more than any other is about the destination, more so than the journey. 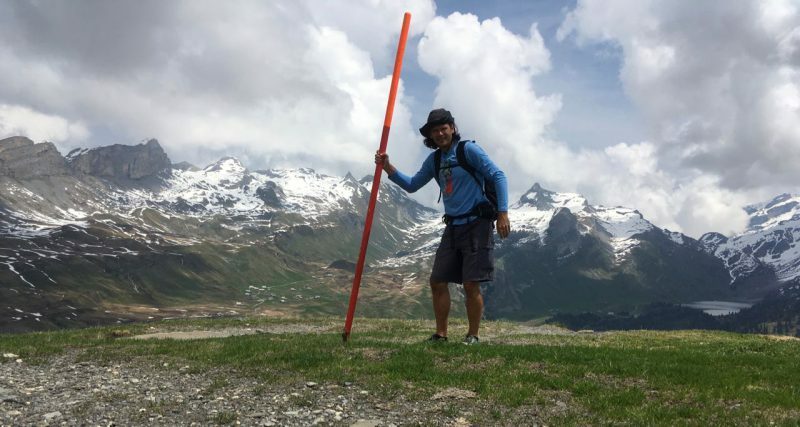 Whether you started in Saint Jean Pied de Port, or in some other city nearer or farther, we all felt Santiago getting closer and pressed steadily on. The pace downhill seemed to increase as we entered tidy suburbs and descended into the older section of the city. We did start to orientate ourselves by securing lodging at the Albergue Azabache, one of the few right in the middle of everything, getting two of the last remaining beds – actually in an excellent room with windows overlooking the final stretch of the Camino. There were other tasks to work on. 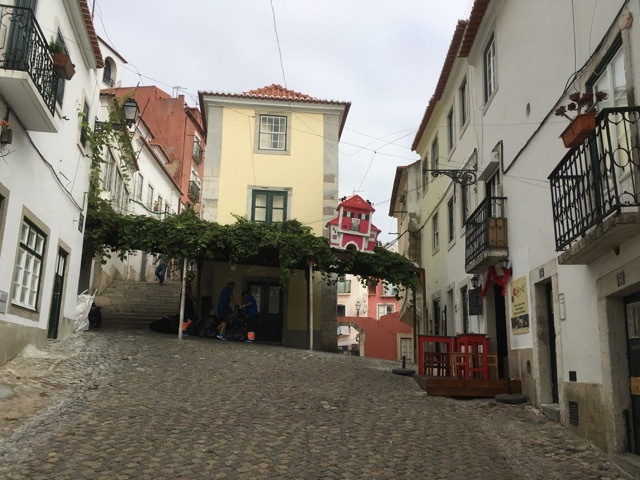 We needed to figure out where the Pilgrim’s Office was (it had since changed locations from our guide book and maps) and to figure out if we could take a bus or tour to Finisterre, and what the train timetables were to get to Portugal. So we spent a good bit of time just wandering about, a little confused about the best way to go about it. After doing some of our research, and a little bit of souvenir shopping (we permitted ourselves none while we were on the Camino for the sake of not carrying anything extra) and hugging the statue of Saint James and viewing his supposed tomb in the Cathedral, we went to the Pilgrim’s Office, where we waited in line for 45 minutes to show our Credencial with all the stamps we’d collected at ablergues, churches, and restaurants along the Way, and have the final official stamp placed upon it, and receive a certificate of completing the Camino. Amid all these errands, we ran into Roxana and Magnus, and we made plans to meet up for dinner after the evening Mass. We went to the 7:30 Mass, along with hundreds of other pilgrims who filled the main nave and the transepts to standing capacity. While I can’t say that I got a lot out of the service, not being too attentive to the Spanish, I actually was moved by it and so glad to be a part of it. After all the running about on the streets of Santiago during the day, and waiting in lines, and shopping for gifts or food, or getting travel information to plan our next day, we got to finally just sit still, and be among all the other pilgrims who finished that day. It did feel sacred, and a more fitting end to our Camino, inside the Cathedral, rather than the bustling plaza on the outside. 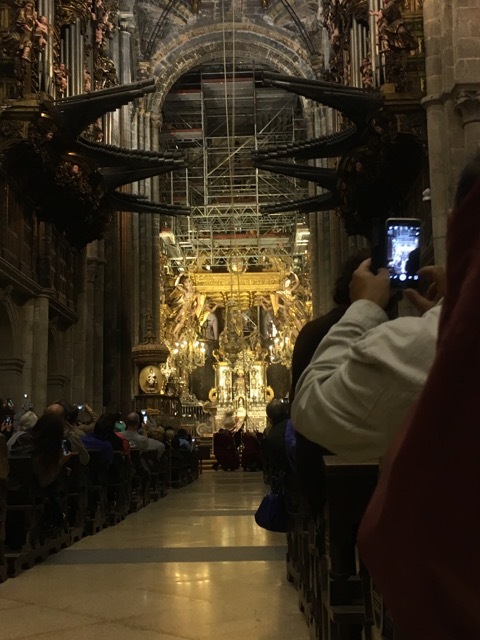 We were also fortunate that they got out the huge golden incense “thing” that hangs from the center of the Cathedral and swung it from side to side. They don’t normally do this, but on Fridays. And then the service ended, and we followed the masses outdoors, onto the streets, and to our own journeys elsewhere. I think later I will write more about this. More about the Camino in general and what it has meant. I’m not sure I can even answer that now. So let it suffice to just say, “We have finished.” On to other journeys. Perhaps it is fitting that today somehow felt anti-climactic, and lacked a sense of closure or awe. 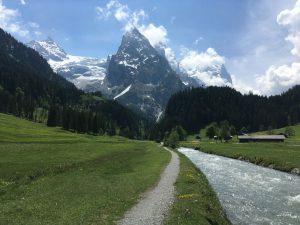 Maybe it means that walking the Camino is not in order to complete your journey, but to prepare you for the “next” journey – the pilgrimage of everyday life, wherever that may be. The previous night, we treated ourselves to a private room at Hotel Chiquitin. Rather, I should say Kim’s parents “treated” us. 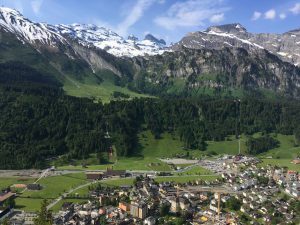 Perhaps my accounts of crowded albergues had them wanting us to be pampered a little bit, so they wrote that they wanted us to stay in a fancy hotel on their tab. We took advantage of it in Burgos, and while Melide was not a fancy town, we treated ourselves there. At 40 euro, it’s probably not as fancy or expensive as her parents were hoping for, but a small private room with a private bathroom on the Camino feels like luxury to us. We went out for a simple dinner by ourselves, and supplemented it with supermarket snacks that we took back to our room. We slept a decent night’s sleep, and got started on the Camino a little after sunrise. 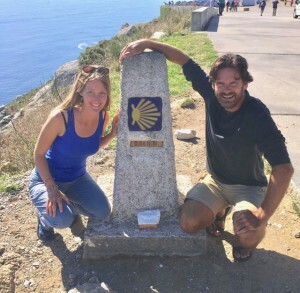 We knew that this would be our last “full day” on the Camino, and eating our standard “to go” breakfast from the market (chorizo slices, nectarine or peach, and some pastry snacks) it kind of felt like we were still in the middle of the long journey. Even though we enjoyed the private room, we knew that the next night on the Camino, as well as our “finished” night in Santiago would be in the shared albergues. I do not mean this as an annoyance or disappointment, for we had talked about it before, that for our last nights, we wanted to be in the albergues, among the other pilgrims, finishing with them, sharing in their camaraderie. We looked forward to it. 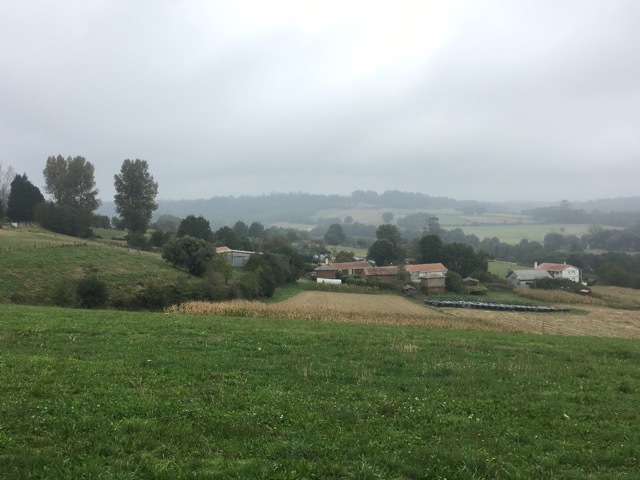 We walked the Camino this morning beneath overcast skies, and misty horizons, passing through more pastoral villages. We stopped in the hub town Arzua for a breakfast a kept moving. We wanted to do a slightly longer day in order to be within closer reach of Santiago for the final stretch. We were delighted en route to come across our “old” friends Roxanna and Magnus, a Romanian-British couple whom we’ve been crossing paths with since day 2. We walked together into our final hub town of Pedrouzo. 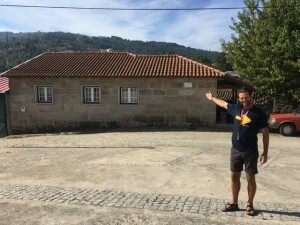 Lured by the signs entering town, we all four settled on the ultra modern Albergue Cruceiro del Pedrouzo, and agreed to pay the extra for 30 minutes in the on-site Sauna. While we waited for our turn, we grabbed some wine, cava, chips, olives, and grapes from the market and at them. The heat and steam of the sauna felt great on our bodies, and a well-deserved pampering before the final stage. Afterwards, we all went out to dinner for the pilgrim’s menu at a nearby restaurant. I’m not sure if it was the mileage we walked, or the snacking, soaking, and supping that made us feel tired and ready for sleep. 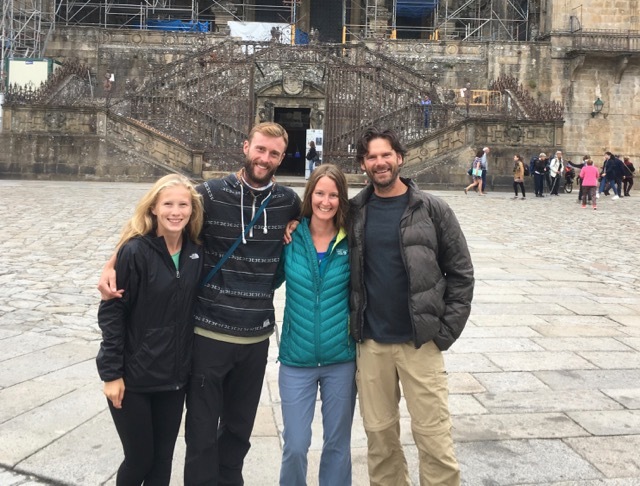 Way back in the early stages of the Camino, I recalled the movie “The Way” how four random people ended up walking together. I also thought of some of the stories I’d heard from solo pilgrims how they ended up befriending others and walking with them. I said to Kim that even though we were sharing this experience together as a couple, and even though we were walking a pace that disqualified most of the people we passed, I desired to have that type of experience – befriending someone, or some other people that become your companions for a stretch of the Camino, whether by default or by agreement. We both agreed that we weren’t going to go around looking for such people to walk with, to force the situation, but that if serendipity should grant it, we would welcome it. 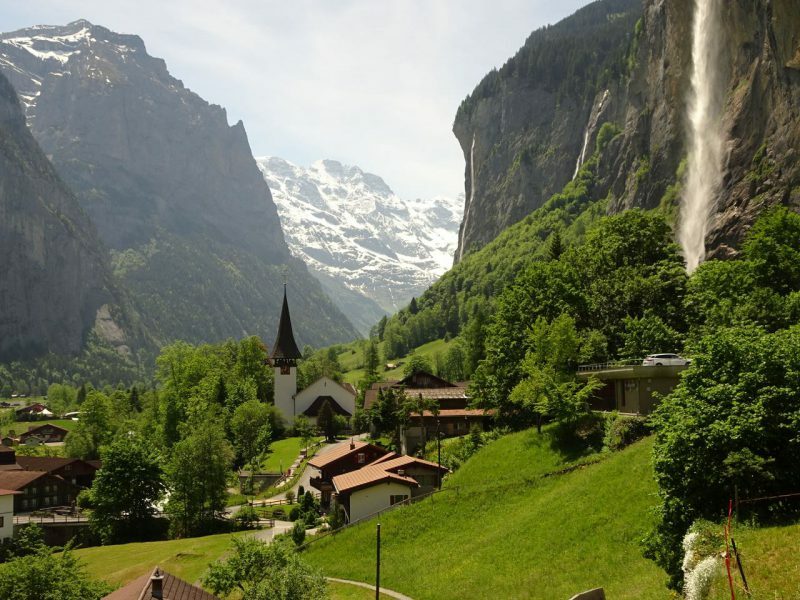 After days, scattered over weeks, of crossing paths with Roxanna and Magnus over meals in the same town, and some of the same lodging, it was very nice to walk with them through the afternoon into our overnight town, and to pass the evening together. To me it is the perfect way to spend our last night before walking into Santiago tomorrow. I feel pampered by serendipity. To our surprise, our albergue dorm of 20 bunks, actually did not have a bad snorer in it, nor early risers that make lots of noise getting up and packing their things, such that we slept decently in more so than normal, and got a bit of a later start. 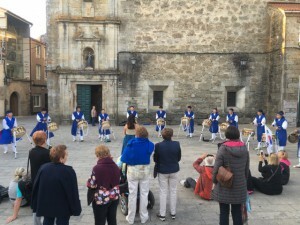 Because Gonzar is not a typical hub town for overnighters, we joined our stretch of the Camino at a time of day that was not amid the main bubble of the passing pilgrim procession, so it did not feel nearly as crowded as the previous day. 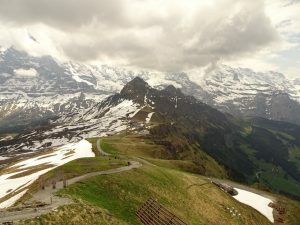 We soon summited a rise that afforded a view to the East where we had come from, and the sun was just cresting the mountain ridges we’d passed a few days before, and in the valley that we had passed through yesterday, there was an ocean of clouds and mist below. 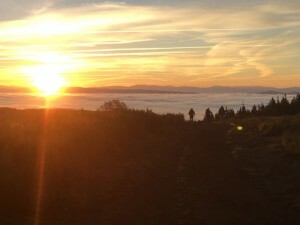 I think it was probably the best sunrise vista we’ve had on the Camino. 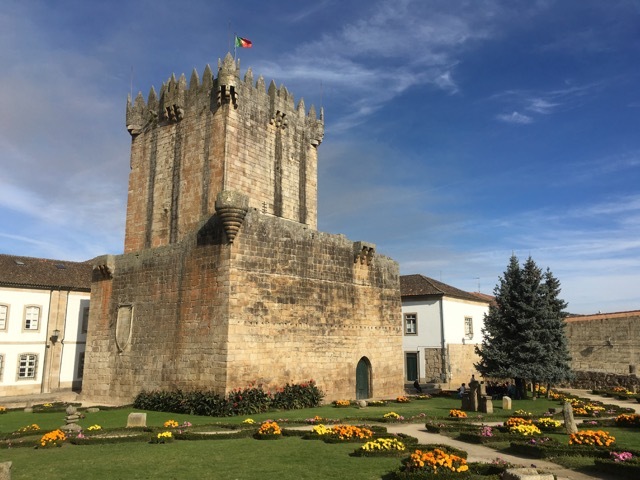 We stopped for an omelet breakfast at another albergue en route, and when we got to the next hub town of Palas de Rei, we elected to eat our lunch by buying a mix of cold edibles to be eaten picnic style in the plaza, before heading toward our anticipated overnight town Melide. 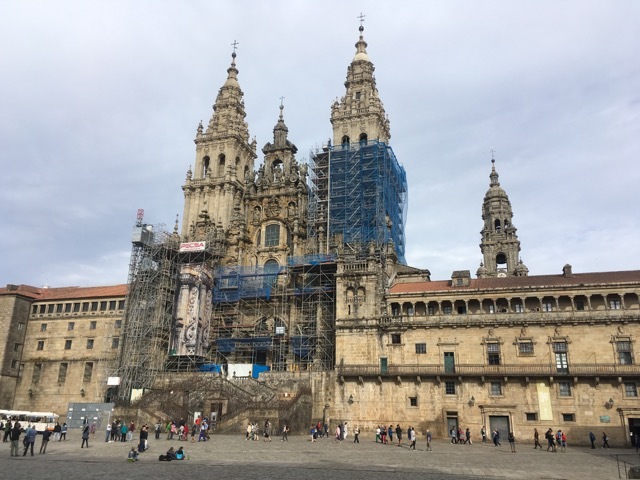 Back on the Camino in the afternoon, we felt our mindset adjusting as we looked at the mileage markers to Santiago, now knowing we are nearing the end, and that we can accurately predict when we will finish. The journey felt long at the start, with unpredictable, intentionally unplanned weeks ahead, but now we’re starting to count the days, and strategize our timing down to our flight home from Lisbon. It seems to have gone by fast, and we find ourselves talking about home – looking forward to October, our favorite month in Asheville, and seeing the change of season. Seeing friends and visiting our favorite haunts, and seeing what “new” things have happened or opened in town. Going to LEAF festival. And of course, receiving the celebratory greeting from El Guapo. One thing we’re NOT looking forward to going back home is the election. We haven’t watched hardly any TV, or checked social media or news outlets which I’m sure are abuzz back in the states. It’s been such a welcome break, and though I was looking forward to being away from “our” news, I did make a bit of an odd decision before the trip started. I sewed a USA flag patch on my backpack. Let me explain. Soon before leaving, I had a conversation with another traveler friend, where we agreed that we both despised the suggestion that an American should put a Canadian flag on their gear so that they would be better received internationally. Not only is it proclaiming a false identity that would be hard to maintain in friendly circles, but it assumes that a nationality bestows congeniality upon you rather than your own behavior among others. 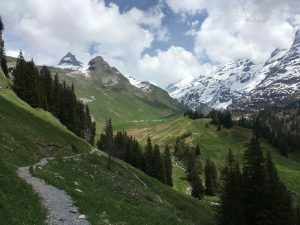 If you are indeed a conscientious and curious traveler, as I like to think of myself, then let it be an opportunity to be an ambassador for your country – to improve its reputation abroad when it needs it most. 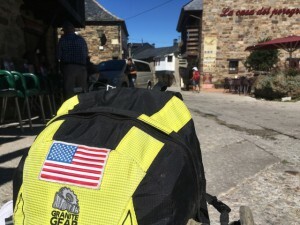 And so in thinking that I should walk my own talk, I decided to put the flag on my backpack, not as an expression USA #1 patriotic zeal, but to reminding myself to be a humble and positive representative of my country, a powerful and influential country. I hope that is what has happened, despite the fact that most people who see it are those whom I’ve already blown by as I walk a faster pace. But I try to be friendly in doing so, speaking the local language, and when I do talk to people about where they are from, that I express my knowledge of their home and history, or my curiosity in learning more. This I’ve done, but let me say, it hasn’t felt like I needed to “win people over.” It has seemed that whether it be fellow pilgrim or local person, they all seem amiable from the start without knowing me, my nationality, my politics, or my faith. My biggest hesitancy to putting the flag on my pack was I did not want to invite any conversation about our election. 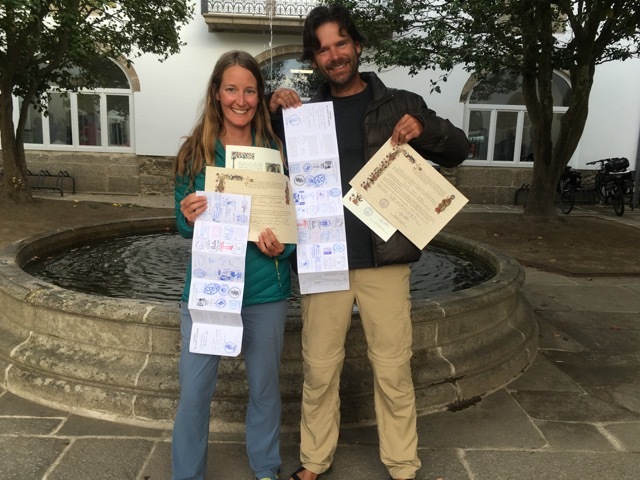 Kim and I both feared we would be asked about it a lot, and someone who had walked the Camino before said to expect people to ask us about our political system and our candidates. We wanted to avoid such conversations as part of our retreat from the American news cycle. But to be honest, we’ve been pleasantly surprised. Not many people have asked us about it, and those who have are people who did so out of non-judgmental curiosity after establishing a rapport around other subjects. 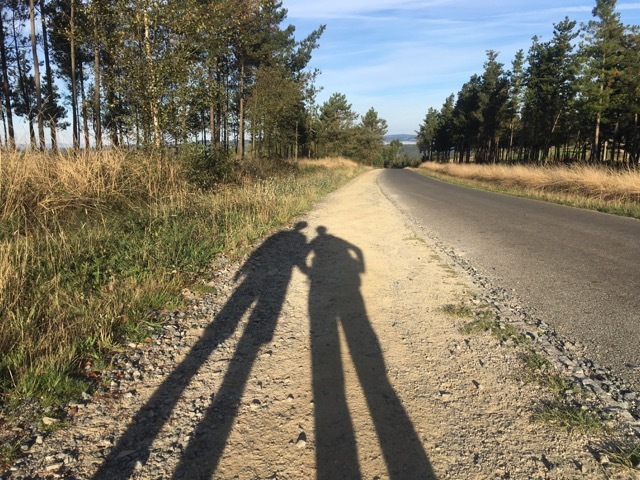 Some Italians who asked us about it said “Our politics are even worse, but our bad leaders only impact Italy, the American leadership impacts the world.” The world is watching and wondering, but fortunately on the Camino, Kim and I have not had to account for it too much. 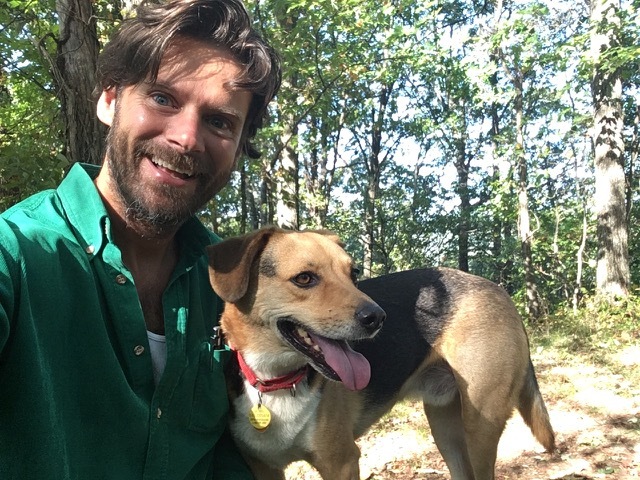 Just as many people have asked us about the Appalachian Trail as the presidential election. That’s a beautiful surprise.